It is undeniable that technology has made a tangible impact on the nature of musical listening. The new media have changed our relationship with music in a myriad of ways, not least because the experience of listening can now be prolonged at will and repeated at any time and in any space. Moreover, among the more striking social phenomena ushered in by the technological revolution, one cannot fail to mention music’s current status as a commodity and popular music’s unprecedented global reach. In response to these new social and perceptual conditions, the act of listening has diversified into a wide range of patterns of behaviour which seem to resist any attempt at unification. Concentrated listening, the form of musical reception fostered by Western art music, now appears to be but one of the many ways in which audiences respond to organized sound. Cinema, for example, has developed specific ways of combining images and sounds; and, more recently, digital technology has redefined the standard forms of mass communication. Information is aestheticized, and music in turn is incorporated into pre-existing symbolic fields. 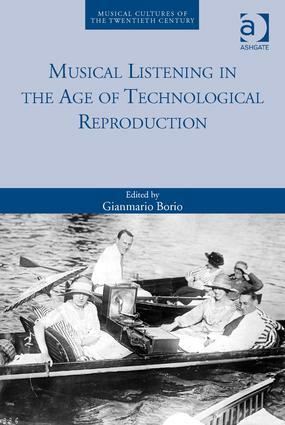 This volume - the first in the series Musical Cultures of the Twentieth Century - offers a wide-ranging exploration of the relations between sound, technology and listening practices, considered from the complementary perspectives of art music and popular music, music theatre and multimedia, composition and performance, ethnographic and anthropological research. Gianmario Borio is Professor of Musicology at the University of Pavia and Director of the Institute of Music at the Fondazione Giorgio Cini, Venice. In 1999 he was awarded the Dent Medal by the Royal Musical Association. In 2013, he was Distinguished Visiting Professor at The Italian Academy for Advanced Studies in America. His publications deal with several aspects of the music of the twentieth century, including theory, aesthetics, political background and the audiovisual experience; as well as the history of musical concepts and the theory of musical form. He is a Fellow of the Academia Europaea.